An irresistible invitation to travel, your Hotel Monte Cristo immerses you in a distinctly 19th century atmosphere that evokes, first and foremost, the tale of Edmond Dantès and his creator Alexandre Dumas, but also the other great adventure novels of the period such as Around the World in 80 Days. Travellers have hearty appetites, so you’ll want to start your day with our quality breakfast. The start of the morning tends to set the tone for the rest of the day. That's why the Monte Cristo team has chosen to ensure that this time is the best it can be. Whether you're already awake or need a little more time, you'll enjoy the decorative details of the dining room in which you are invited to relax and enjoy your breakfast. Azulejo tilework, mahogany, and blue velvet chairs evoke the decor of the Orient Express and trips by steamer. 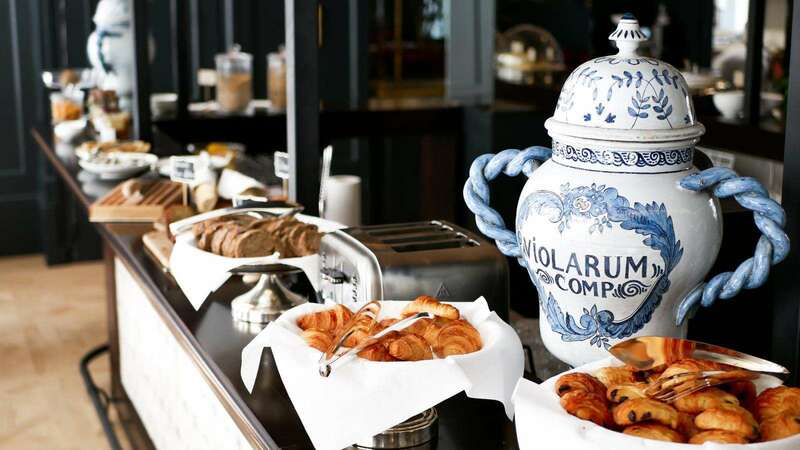 In our breakfast buffet selection, you’ll find all the essentials you expect from this first meal of the day. Viennese pastries, toast-making facilities, savoury and sweet items and assorted kinds of bread are available. However, what ensures the quality of our buffet is that each of these products has been carefully selected. The eggs, whether boiled or in an omelette, are free-range and the cottage cheese, muesli and the various spreads are organic. The teas come from Kodama while coffee lovers will be delighted to discover the Montecristo x Terres de Café range. Finally, our gluten-free banana cake will appeal to those with restricted dietary requirements. Help yourself to a first meal of the day that is fresh, tasty, predominantly organic and always in the spirit of the famous French breakfast. Get off to a good start with our quality breakfast. Our assortment of exceptional food items will be an integral part of your exotic and timeless experience at the Hotel Monte Cristo.